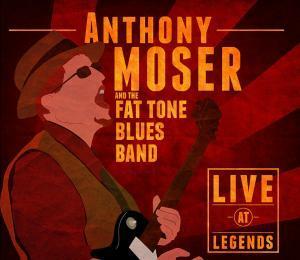 Anthony Moser loves writing and making music. He also loves the blues, and he gets to witness some of the best blues artists in the world play just about every day in his position as the Director of Online Sales & Social Media for Buddy Guy’s Legends club! Earlier this year he and his band, the Fat Tone Blues Band had the privilege of opening for, and later joining Buddy Guy during one of his SRO January residency shows. We were able to catch up with him for a New York minute and here’s what he had to say. Barry Kerzner for American Blues Scene: What was your first instrument? I grew up around instruments and we always had a piano in the house. I played an Appalachian Dulcimer for a minute, and I played a trumpet for like, three months. The first thing I actually took to was the banjo. When I was 15, I started playing the banjo. When did you get to harp and guitar? I was messing around with harmonica; I was doing a lot of folk music, so it kinda all fits right in there. I started guitar not long after, but I got more serious about it when I went off to college. I mean, I grew up doing choir, so it would definitely have been like, some kind of choral thing, as a kid. I did choir all through high school and everything. I had a couple of small groups; I had an a cappella group I was part of, doing choral stuff. I didn’t really have a band. I didn’t start doing that kind of thing until I was in college. As far as music and performing, what has been your best experience so far? That’s a good question. I guess probably – I think the best show I’ve ever had was earlier this year actually. I got to do one of the January openers at the club for Buddy [Guy]. It was just such a great experience, in a lot of different ways. I got to play a bunch of my music, but it was also this kind of culminating experience of working here, and being here, and finally getting to perform in one of the big shows. It went really well. I had everybody that I wanted playing there behind me. So, yeah; that’s probably one of the best shows I’ve ever done. What has been your worst experience, that you want to talk about? Sure. Ya know man, I’m sure there’s more than a few embarrassing moments. I had an experience one time where I was playing a gig, and you’re supposed to have spare strings, but I didn’t, and I broke two strings in the first set. I was a little worried that I would have to do the whole second half with just four. Luckily, there was a guy there who just lived nearby and went and got a guitar. That was an embarrassing one. Yeah, I’ve played a bunch of unusual shows at various points. There have been some awkward moments, but for the most part, it’s been going pretty well. Since you are the Director of Online Sales & Social Media for Buddy Guy’s Legends club, what advice would you like to share with musicians regarding social media? Yeah! I think that there are a couple of main takeaways. One is that you have to pick something that works for you, and just do it a lot. You gotta have a Facebook page probably, but as far as other stuff goes, you can pick like Instagram or Twitter, or whatever it is that works for you, and keep doing it. I guess the second thing would be make sure that you are sharing your music, if music is what you are doing. Make it so that people can listen to you. Mostly, be yourself. I think it’s easy to tag the music to lots of other stuff that’s happening, like ‘Let me show you this.’ It’s a hard line to walk where you want to share your music but you don’t want to spam people by throwing it at them over and over again. You want to just organically develop a following. That’s much easier said than done. What do you hope to, or want to, accomplish with your music? I don’t know. It’s interesting when I look at it. I don’t know that I have a specific end point that I’m trying to achieve, like ‘This is where I want to go with this’ necessarily. I have some short term goals. I have this album I’m trying to put out. I’d like to be playing in some more places around the city. I got some other things that I’d like to do, but I can’t say that that has a big ending that I’ve got in mind. I think for me, in a lot of ways, it’s not something that I do because I have a goal that I want to accomplish by doing it. It’s something that I do because I find it meaningful inherently. Like, I write songs because I feel like I have something I want to express, and that is the best way that I can do it. What I hope to do is to continue to do that. I write stuff that can be topical sometimes, things about politics, or songs about Google, whatever. It’s easy to want to just tie it to stuff, like, ‘Hey you guys. I wrote about this. This is what’s happening!’, but it doesn’t work that way. So, if anything, I would like to just be able to continue to grow an organic following and develop people who will appreciate already that I’m trying to write about things that are happening. So basically just get the word out to more people, or be appreciated for what you’re trying to say? Yeah. I write things that I hope are meaningful, and I would like to share them with people, in the hope that they might find them the same way. I that that’s what music does when it does its best stuff. I mean, a way of expressing something important about something that’s happening, or some element of being a person.